So, you’ve just installed a water garden and you’re wondering how to landscape around it without looking like the pond was a mistake or haphazard addition to your yard. 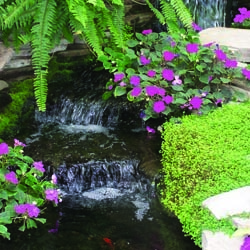 A pond looks best if it appears to “belong” in your landscape. Whether your garden has a natural look or a formal style, the secret is to use plants that look right at home at the water’s edge and blend well with your existing landscape. Lining the margins of the pond with small rocks disguises pond liner edges and gives an informal look to the water garden. A larger boulder actually overhanging the pond is an ideal spot for kids (or you!) to watch fish, frogs and dragonflies. Continue the theme in the surrounding landscape with some groupings of larger rocks, creating additional shelves or niches for an uneven, natural look. In general, trees should not overhang the pond, as a water garden needs 5 to 6 hours of sun for aquatic plants to thrive and intrusive roots could damage the liner as trees grow. However, a small specimen tree will give your water garden scale and is a good starting point to the planting surround. Select smaller growing trees such as Japanese Maple, River Birch or low-growing flowering trees like Star Magnolia, Crepe Myrtle or Snowbell (Styrax). Position them slightly back from the pond’s edge in a suitable space for their own growth needs. Shrubs give the landscape substance as well as flower and foliage interest at different times of the year. For winter color, select some evergreen shrubs like pines, spruces or junipers. A water garden located in the corner of your yard might have a backdrop of taller shrubs and smaller growing ones in the foreground. A more centrally-located water garden should have lower-growing shrubs all around so the pond can be viewed from all sides. Azaleas are a favorite for early spring color. Perennials and ornamental grasses form the final layer of landscape. Select perennials that bloom at different times or with interesting foliage for color and texture all season long. Some favorites include Siberian iris, coneflower, rudbeckia and daylilies for sunny areas, with astilbe, hosta and ferns for more shaded locations. Plant perennials in large clumps or flowing drifts for the most impact. Ornamental grasses are a spectacular addition to the water garden. Where a tall-growing grass is needed, use varieties of Miscanthus, Erianthus and Molinia. Graceful Fountain Grass is attractive planted in large groupings, while vibrantly-colored Japanese Blood Grass forms a dense low-growing mass for foreground plantings. 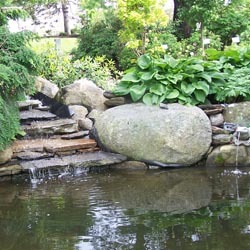 Be sure to create a place in your pond landscape where you can sit and enjoy your water garden – an overhanging rock or strategically placed garden bench can be ideal. Lighting, too, is important to bring your water garden to life at night. Create dramatic effects both by spotlights around the pond and submerged lighting if possible. With thoughtful landscaping, your pond can be an integral, beautiful part of your landscape and a focal point for stunning landscaping design.